CNN asked who’s the best Filipino voice for Waze & the Internet went wild! In a place like Manila where painful traffic is everywhere, Waze is the most dependable app used for navigation. Waze is so reliable that people use it to travel in both the city and the province. Which is why the Waze recently broke the internet when a question from news group CNN was posed asking netizens who they think the Filipino voice of Waze should be. The question, posted last July 3, gathered 49,000 reactions and more than 37,000 shares plus 39,000 more comments – ranging from the wildest, most absurd, to the funniest answers. Imagine the famed comedian from the 80s and 90s , Babalu, as the voice of the Waze. What do you think about Gus Abelgas, the host of the ABS-CBN’s Scene of The Crime Operatives? We think he’s perfect for an intense late night drive. Here’s Susan Roces’ voice giving you Ang Probinsyano’s Nanay Flora realness. And if there’s Nanay Flora, then there should be Coco Martin’s Cardo! 6.Celebrity talk show host, Boy Abunda making you feel like the guest of his late night show, Tonight With Boy Abunda. 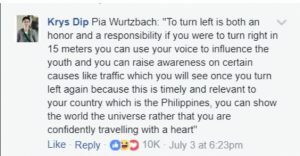 Think about the Miss Universe 2015 Pia Wurtzbach giving you queenly directions. And of course, everybody’s best friend Rufa Mae Quinto in her boobalicious voice.